Ah the Pliers, an absolutely essential piece of jewellery making kit whether you’re beading or setting a €50,000 diamond. They can cost you a euro or a hundred, the quality most assuredly being reflected in the price. And you need more than one. It comes from the french word for bending, another jewellery term with french origins! And while i suppose the cutters shouldn’t be in this far from comprehensive list, they are. Round Nose Pliers Primarily used to bend wire for jump rings, chain making, filigree work, and wire wrapping. Both jaws have a round cross-section and taper to a fine point at the tips, making them great for getting into tight areas. Chain Nose Pliers – for getting into tight areas and for precision work. Useful for any fiddly work, bending thin wire etc. Jaws taper to a fine point and the cross section is flat where the jaws meet and round on the outside. 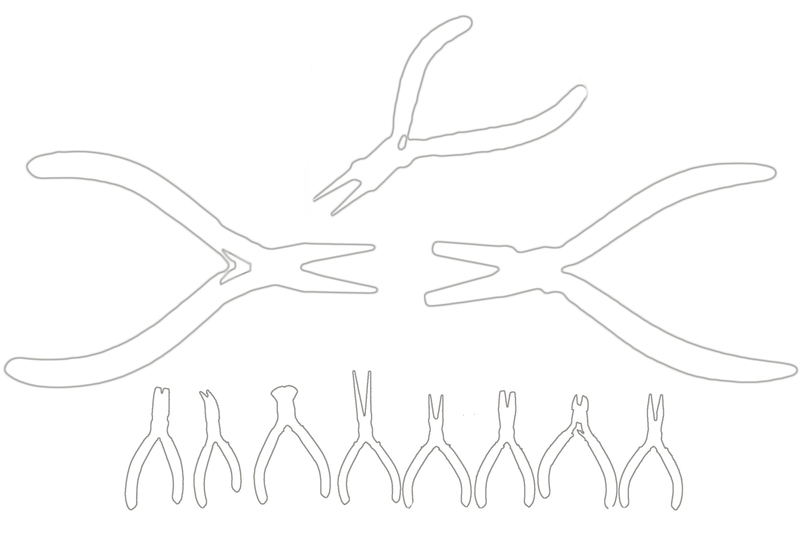 Bent Nose Pliers – chain nose pliers where the top half or third of the jws is bent laterally about 45 degrees. It doest get into tighter areas than the chain nose. Cross section and taper is the same as chain nose pliers, but the jaws bend to one side. Flat & Round This forming plier is used for making small loops and jump rings and for bending tight curves in sheetstock. The lower jaw is round and tapered like a round nose plier, while the upper jaw is like a flat nose plier. Concave & Round Similar to the concave/convex forming plier, but more useful for making smaller diameter loops and jump rings. The tapered lower jaw provides a range of diameters for wrapping wire and sheet. Diagonal Cutters For cutting wire or small pieces of sheetstock. This is the most commonly used cutter and is available in standard bevel cut, flush cut and super flush cut. The tapered ends allow it to get into tight areas. End Cutters The cutting edges of these cutters are set at right angles to provide easier access and a better view of work in tight areas. Oblique Cutters Similar in design to end cutters, but with jaws that are slightly offset to one side. The offset provides increased clearance. Available in flush cut and super flush cut versions. Sprue Cutters Designed specifically for cutting casting sprues. The compound joint and spring action provide maximum leverage with minimum effort. Also useful for cutting thick stock and hard materials. So that’s a taste of just a couple of pliers used in jewellery making and gives you an insight into the variety and complexity that can be present in working with these precious materials.